Bestselling author Adriana Trigiani is beloved by millions of readers around the world for her hilarious and heartwarming novels. Adriana was raised in a small coal-mining town in southwest Virginia in a big Italian family. She chose her hometown for the setting and title of her debut novel, the critically acclaimed bestseller Big Stone Gap. The heartwarming story continues in the novel’s sequels Big Cherry Holler, Milk Glass Moon, and Home to Big Stone Gap. Stand-alone novels Lucia, Lucia; The Queen of the Big Time; and Rococo, all topped the bestseller lists, as did Trigiani’s 2009 Very Valentine and its 2010 sequel Brava, Valentine. The novel is split into three parts: Italian Alps, Manhattan and Minnesota. How would you characterize Ciro and Enza in each of these sections? How do they adapt to their new homes? In what ways did they change over the course of the novel? In what ways did they remain the same? How would the course of both Ciro's and Enza's lives have been different if they hadn't gone to America? Do you think they would have ended up together if they had stayed on the mountain? Enza and Ciro shared their first kiss beside Stella's grave. In what ways did digging the grave open up Ciro's heart? When Ciro opened up his duffle bag on the ship to America, “the fragrance of the convent laundry—lavender and starch—enveloped him, fresh as the mountain air of Vilminore” (p. 120). What other aspects of convent life stayed with Ciro and Eduardo after they left? What did they learn from the sisters? Enza “found a best friend in Laura, but so much more” (p. 195). What do you think made Laura and Enza's bond so deep from the beginning? In what ways did they support one another? Did anything surprise you about the characterization of Enrico Caruso? How would you describe his relationship with those around him? How did the time he spent with Enza and Laura affect them, even decades later? 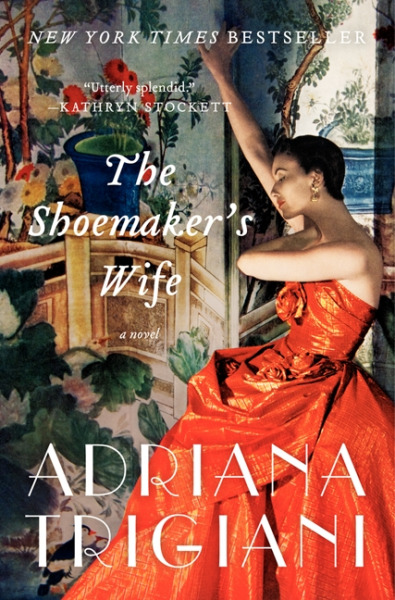 How does The Shoemaker's Wife portray the immigrant experience? Do any of your own families have a similar immigrant history? Did they have a different experience? Enza and Ciro have different views of religion. In what ways do their beliefs shape their actions and relationship? How do you think Enza's life would have turned out if she had married Vito? If Ciro had married Felicitá? What did Vito and Felicitá offer them and what did they lack? Carlo Lazzari warned Eduardo to “beware the things of this world that can mean everything or nothing”. In what ways did this advice ring true throughout the novel? What effect did fighting in the Great War have on Ciro? Do you believe he returned to Manhattan a changed man, or did the war just force him to acknowledge what he had known all along? When Ciro saw Enza on the steps of Our Lady of Pompeii church, moments away from marrying Vito, “it seemed like fate was on his side.” Do you believe that fate brought Ciro and Enza together on that day? Overall, do you believe that Ciro and Enza were destined to be together? Enza once said to Ciro: “I remind you, I imagine, of things you'd rather not think about.” What do you believe Enza meant by this? What challenges did Ciro and Enza face in their relationship? How did they differ in their ways of communicating? How did Ciro, Enza and Antonio each react to Ciro's diagnosis? What were Ciro's fears and hopes for his family? In what ways will Enza and Antonio fulfill his dreams? At the end of the novel, Enza agrees to return to Italy with Antonio and Angela. How do you imagine the reunion between Enza and her family? How will Schilpario be different for Enza when seen through Angela and Antonio's eyes? Read “Realizing the American Dream, a Book Club Discussion” by Reading Group Choices' Neely Kennedy for discussible topics and themes!